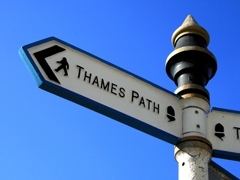 The Thames Path runs for 180 miles along the banks of the river Thames. A short section of the path approaching the Thames Barrier was incomplete; the Royal Borough of Greenwich initiated a programme of works to fill in this “missing link”. The 'missing' section of path would need to be suspended from a parapet wall acting as a boundary to an industrial estate adjacent to the Thames. In order to confirm that the wall would support the expected loads, a load testing programme was required to investigate the redundant capacity of the wall and foundations. Lucideon designed and fabricated a rigid steel load test rig and cast a series of concrete prisms for use as dead weights for applying load to the parapet wall. The test rig was craned into place and mechanically fixed onto the river side of the parapet wall prior to positioning the dead loads. The movement of the wall was monitored throughout the loading via a total station deflection monitoring instrument which was installed on-site. Prisms were fixed to the loaded walls and test rig to allow remote measurement of movements during both the loading and the loaded phases. The load was left in position for three weeks prior to unloading and removal from site. The total station was programmed to read the prisms at 30 minute intervals for one week prior to loading to gain a background reading of any movement generated by the river tides. The monitoring was increased during loading to obtain real time movement of the wall and load rig and then reduced to 30 minute increments during the three week loaded phase. A visual survey of both the land and river side of the wall was carried out prior to loading in order to identify any cracking of the wall. The cracks on the river wall were instrumented in order to measure any opening up of the crack due to the loading. The movement limit of the wall was set at 25mm, the actual maximum movement was measured as 3.2mm with no measured widening of the parapet wall cracks. Lucideon’s testing proved that the parapet wall had sufficient capacity to carry the new section of pathway and was well within the performance criteria and safe for use.